It’s been awhile, again. But quite a few things have happened too, again. First off there are 2 engravings that I’d like to share with you. A solid brass Zippo, made for ‘proof of concept’ to see how engrave able it is and maybe offer it for selling in some shops. 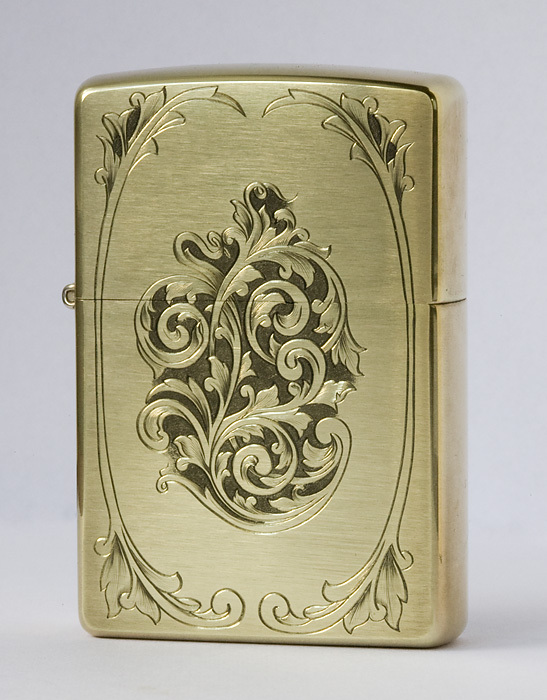 Zippo design is what I might call classical American design- if you look at American engraved weapons they mostly have this kind of scrolls. Second engraving I did was on a folding knife. 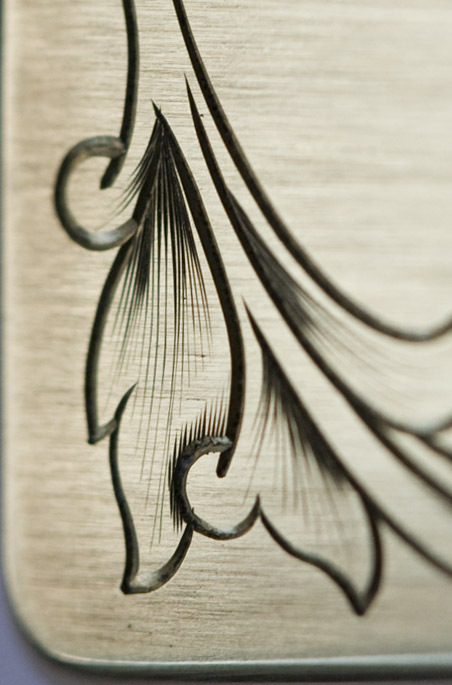 It was especially made to ‘show off’ engraving, hence the plain stainless steel handle. For this design I got inspiration from Steve Lindsay engravings, a guy whose style and skill I really admire. This style usually doesn’t use any spirals like in American, English and other styles and has large leaves with lots and lots of shading. Time spent on design was 1 day, cutting took about 3.5 days, but I think was quite worth it. Oh, and both of these engravings were made with Lindsay engraver, which I think is extremely good for doing super-fine shading. There’s this joke about government and it’s practices: “We’re dealing with this – papers are lost. We’re dealing with this actively – we’re looking for papers.” Exactly this happened when I ordered new Lindsay engraver and microscope. I got the engraver just fine – shipping was about 3 days from US to here with FedEx and 30 minutes of filling out customs papers. But the fun began with scope. On 2nd of Sept they mail me and ask for microscope invoice, I sent it at same day. Then I wait 2 weeks to get my stuff. During this time I call customs about 5 times and each time they say that there’s 1.5 to 2 weeks of queue in filling out the forms… OK, no problem. Then I get the second note that they need invoice for scope… What the…? I send it and call – yes, they received it, filled the forms and sent the package out. Lo! and behold, indeed the next day I get my heavy package. There’s no fsck’ing microscope there, only the stand. After few calls to postal service, to guy in the customs who filled the form, to customs director and to customs secretary (that was how I got forwarded) it came out that actually there were 2 packages and one is still in customs. So I send ’em email with all the data of how much I paid, the serial numbers and whatnot. I call. Yes, they got it. Yes, they’ll send it out. I make another round of calls to form filler, secretary who suggest that I should try to call to warehouse. And here comes word to word quote from warehouse gal: “That package? Hmm, let me see. No, it’s not here. Maybe I’ll call you back?”. Forward 2 hours I get the call: “Hello. Yes, the package is on its way now. What was the problem? It seems that papers were lost…”.